If you’re like most people, you have your tax refund spent before you get your hands on it. Maybe you’re planning to use it to pay off a delinquent debt. Unfortunately, depending on the nature of that debt, the federal government might be one step ahead of you. The U.S. Department of the Treasury might pay it for you, with or without your consent. The process is called a “tax offset,” and is perfectly legal. Even worse, it can happen again and again until it's finally paid off if the total debt is greater than your refund each year. The federal Treasury Offset Program (TOP) is the force behind tax offsets. It authorizes the government to intercept a taxpayer’s refund to pay certain outstanding debts. TOP is run by the Bureau of Fiscal Service (BFS), a division of the Department of the Treasury—not so coincidentally the same agency that issues our tax refunds. TOP doesn’t go on a hunt to dig up everyone’s unsettled debts. Certain agencies to whom you owe money can report it to the program if you’ve gone 90 days without making a payment, provided they’ve personally notified you of the outstanding debt first and have informed you of your rights and options for settling it. Consider talking to a tax professional about filing for an “injured spouse allocation” if an offset has occurred against a refund resulting from a joint married return. You might be able to get your share of the refund back if you can prove you’re not personally liable for the debt in question. What Debts Can Trigger an Offset? Basically, they're debts owed to or through a government agency. You’ll receive a heads-up first if the BFS has a current mailing address for you. You should receive a “Notice of Intent to Offset,” letting you know that you won’t be receiving some or all of your tax refund this year. The notice will identify the agency/creditor that will receive your refund instead. It will tell you how much of a refund you would otherwise have received, and how much the debt is. It will tell you how much of a refund—if anything—you can expect to receive after the offset. The BFS will then subtract the money from your refund, send it to the party you owe, and let the IRS know that this has occurred. The notice you receive will also include contact information for the agency to whom you owe the debt. You have a right to dispute it, but don’t bother calling TOP or the IRS. The IRS says that you should take the matter up directly with the agency that submitted your debt and try to work something out with them. The IRS doesn’t have the authority or the necessary information at its disposal to help you. Remember, it doesn’t actually pay taxpayers their refunds—the BFS does that. And TOP can’t pull the plug on an offset without the consent of the lending agency in question, even if you can prove that you’ve already paid the debt. You have no choice but to work it all out with the agency/creditor. Consider reaching out to the Taxpayer Advocate Service (TAS) for help if you legitimately don’t owe the lender but the lender won’t budge. Local offices are listed on their website. Otherwise, you can pay off the debt in question, but you only have 60 days to do so after you receive the notice. Go to pay.gov/paygov/paymydebt, call 888-826-3127, or send payment with proof that you made it to the Department of the Treasury at P.O. Box 979101, St. Louis, MO 63197-9000. You might have more options than in other scenarios if the debt in question is a federal student loan. You can request a review from the Department of Education. You have 65 days to make a request for review after you’ve received notice of the offset, and your defenses are limited. Maybe the loan in question has already been repaid, or you’ve filed for bankruptcy protection and haven’t yet received a discharge—your case is still pending. Maybe you’ve already made arrangements with the lender to catch up with your past due payments and you’re performing as agreed, but the lender hasn't reported this to TOP. Be prepared to submit supporting documentation for your argument. The DOE will look into the situation. You won’t get your refund until it’s resolved, but the lender shouldn't get the money yet either. What if You Don’t Receive a Notice? In rare cases, the BFS might not have a current mailing address for you. 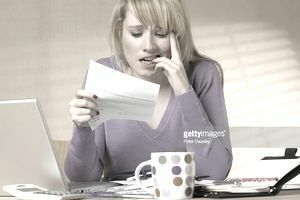 Maybe you requested that your refund be direct deposited to your bank account and you’ve moved since you filed your return and failed to put in a change of address with the post office. For whatever reason, the notice never gets to you. But your refund is less than expected, or it just doesn’t arrive. You can contact TOP at 800-304-3107 on business days in this case. You won’t get to speak to a real live person, but you can enter information at the prompts and TOP will then tell you if any offsets are pending or have been applied to your refund. You can also call the IRS in this case at 800-829-1040. They can help you if the problem turns out to be not an offset but something else. Unfortunately, not receiving a notice isn’t considered acceptable grounds for objecting to the offset. In fact, resistance is often futile. Offsets are initiated by government agencies, so it’s unlikely you’ll be able to sidestep one if you honestly owe the debt in the stated amount.